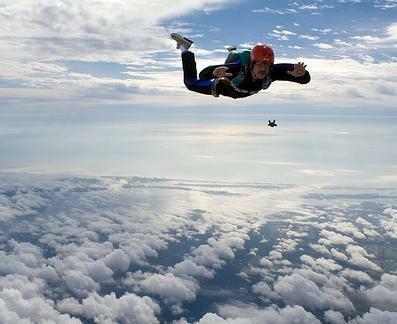 The physics behind skydiving involves the interaction between gravity and air resistance. When a skydiver jumps out of a plane he starts accelerating downwards, until he reaches terminal speed. This is the speed at which the drag from air resistance exactly balances the force of gravity pulling him down. 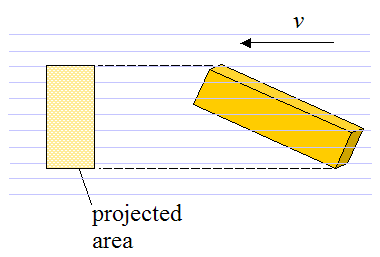 The figure below shows a free-body diagram of this. 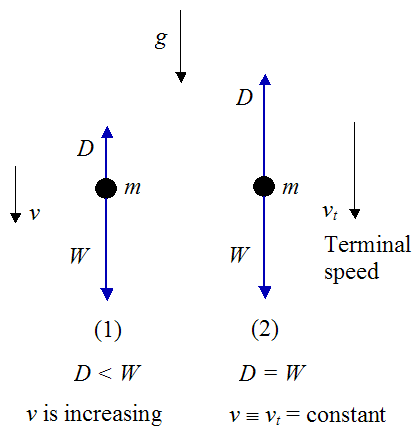 It is easy to understand why his speed increases when D < W. By Newton's Second Law, ΣF = ma, and ΣF = W − D, so his acceleration a is positive and therefore v increases. An important observation is that, the smaller the cross-sectional area A, the higher the terminal speed. So if a skydiver wants to catch up to his fellow skydiver, he can do that by decreasing his A value. One way to do that is to re-orient your body so that your head is facing down. The mass of the object is also an important factor. A feather will fall much more slowly than a solid object such as a rock, because the drag force relative to body weight (mg) is much higher for a feather. A skydiver typically reaches speeds of around 120 mph in the spread-eagle position (shown in the first figure). But he can reach speeds up to 200 mph if he orients his body with head pointing down, thereby decreasing A. 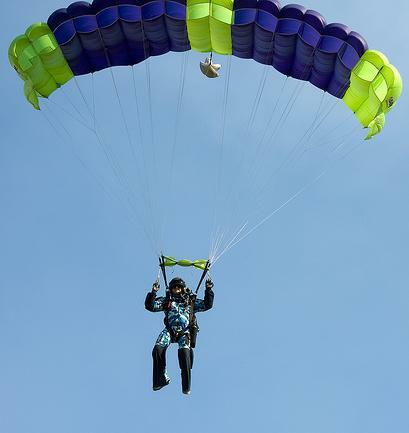 During free-fall a skydiver can perform a variety of acrobatic maneuvers such as spinning, moving forward, moving backward, just by changing the shape of his body to "catch" the wind a certain way. By doing this he is essentially changing the direction of the drag force acting on his body, much the same way airplane wings can be oriented to produce a desired motion for the plane. The final drag force the skydiver must experience is from releasing his parachute, which slows his descent enough for him to land safely.